Jennie Stormes is moving to Colorado. She doesn’t yet have a job. Someone is offering her a place to stay while she gets settled. And she’s leaving behind the support system of friends, educational specialists and doctors necessary to address her son’s severe form of epilepsy. But the Hope Township resident feels the state’s restrictive medical marijuana program has backed her into a corner, leaving her no choice but to seek the treatment her son needs across the country. “The governor is forcing another kid out of the state,” Stormes said. Stormes has been at the forefront of efforts to expand New Jersey’s medical marijuana program to minors, appearing at the Statehouse in September 2013 when the Assembly approved the measure. Now, she attends weekly rallies in Trenton protesting the hurdles those seeking treatment must clear. 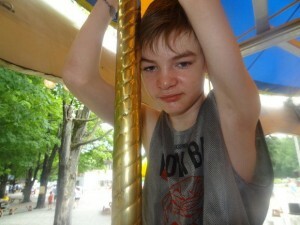 Fifteen-year-old Jackson Stormes suffers from Dravet syndrome, a severe form of epilepsy. Before medical marijuana, Jackson took four non-narcotic and three narcotic anti-seizure medications. He’s since downgraded to two low-dosage non-narcotic epilepsy medications and medical marijuana administered as an oil or tincture, according to his mother. Jackson has gone about two weeks without an unprovoked seizure. “In November 2012, he started using cannabinoids and this is the best seizure control he’s ever had,” she said. Supply isn’t necessarily the issue; it’s more a problem with getting access to the drug in the proper form to treat seizures, Stormes said. While the state amended the law to expand the program, it still hasn’t approved what form in which edibles are available, leaving parents to convert the marijuana into an oil and essentially breaking the law, she said. And Stormes said it’s difficult to control the consistency of dosages because she’s creating the batches herself and is unable to submit them for testing at one of the state’s existing medical marijuana dispensaries. “The state is setting me up to fail and harm my child,” she said. Stormes is also concerned about what she sees as a disconnect between the state’s medical marijuana program and New Jersey’s medical community, pointing to an issue she and Jackson faced at the Hackensack University Medical Center in May. Hospital officials informed her she could not give her son his medical marijuana while he was a patient at the hospital. Hospital officials told the Bergen Record in May that permitting patients to use medical marijuana in the hospital would jeopardize its license as the federal government considers marijuana an illegal drug. Stormes said she decided to move after visiting Colorado in early September to get a second opinion from neurologists about Jackson’s treatment. There, doctors wanted to make adjustments to the medical marijuana component of his therapy, not the pharmaceutical side of things, she said. In New Jersey, Stormes claims she’s had to explain to doctors the differences between THC – tetrahydrocannabinol, the primary psychoactive ingredient in marijuana – and CBD, or cannabidiol, the compound that offers medical effects and can actually counteract THC. Ken Wolski serves as executive director of the Coalition for Medical Marijuana New Jersey, which he co-founded in 2003. In another highly-publicized move, Meghan and Brian Wilson left Scotch Plains in February bound for Colorado, where the couple’s 3-year-old daughter, Vivian, could receive the necessary medical marijuana treatment for her Dravet. It’s unfortunate families must flee New Jersey and become “medical refugees,” Wolski said. A lack of education for physicians is a real problem in New Jersey and the registry for doctors to recommend marijuana is “wildly unpopular,” Wolski said. There are only about 300 doctors registered, he said. There are 359 physicians registered, including only two in Warren County and four in Hunterdon County. Registration requires pain management and addiction control education courses, which Wolski criticizes because the state makes no such requirement to prescribe other potentially addictive pain medications. And he feels there’s a certain stigma to being included on a registry that requires doctors inform patients there is a lack of scientific consensus on the uses of medical marijuana. “To me that is a clearly political statement,” Wolski said. He also advocates requiring that doctors receive continuing education in the medical marijuana program as a requirement of maintaining their licenses. “If you treat anyone with multiple sclerosis, cancer patients or anyone with the qualifying conditions … then by god if you want to keep your license you need to learn about it,” Wolski said. Larry Downs serves as chief executive officer for the Medical Society of New Jersey, which offered input into the design of the state’s program. Physicians wanted to see a bona fide patient-doctor relationship, preventing recreational users from trying to take advantage of the program, he said. Downs disagrees with Wolski’s assessment there’s a stigma attached to registering for the program. If a doctor believes in a therapy, he or she will advocate strongly on a patient’s behalf and not bend to what may be perceived as a social stigma, Downs said. The lack of participation in the registry has more to do with the fact doctors have only been registering for about two years and are also pressed to keep pace with issues such as health care reform, Downs said. And in working with physicians for 17 years, Downs said he believes the biggest issue remains that doctors want to see clinical studies proving its effectiveness. “It’s not a widely accepted, well-proven therapy, so doctors may not be signing up,” Downs said. One of the society’s primary policy positions is calling on the National Cancer Institute to pursue double-blind trials for medical marijuana treatment, Downs said. It takes time for pharmaceuticals to become accepted once released and medical marijuana only became a possible therapeutic agent when it was signed into law about four years ago, he said. As the research and data improve, Downs said he believes more doctors will consider medical marijuana as a treatment in conjunction with traditional pharmaceuticals. But Stormes says her son can’t wait for that day, while the options he needs already exist in Colorado. “I can do what I need to do for my son and I don’t have to worry about the police, the state or the political climate,” she said. Visit jacksonstormes.com to read more about Jackson and his mother, Jennie Stormes, and their experiences with New Jersey’s medical marijuana program.